Son of Joash and father of Azariah (II Kings, xv. 1); came to the throne about 795 B.C. As soon as his kingdom was established he slew the murderers of his father (II Kings, xiv. 5), but contrary to custom permitted their children to live. Very early in his reign he fitted out an army to reconquer Edom, which had rebelled during the reign of Jehoram (II Kings, viii. 20-22), his great-grandfather. Amaziah achieved a great victory over the Edomites, and slew 10,000 (the chronicler, II Chron. xxv. 11, 12, says 20,000) of them. He carried home and set up the gods of Seir (II Chron. xxv. 14) as objects of worship. His brilliant victory over Edom inflated his pride, and he challenged to a combat Jehoash, grandson of Jehu, king of Israel (II Kings, xiv. 8-14). The latter's disdain and scorn for Amaziah are embodied in the stinging parable of the thistle and the cedar (II Kings, xiv. 9). In his resentment, Amaziah rushed into a disastrous battle at Beth-shemesh, and a humiliating defeat overtook his army and the land. The king was captured, 400 cubits of the wall of Jerusalem broken down, the city, Temple, and palace were looted, and hostages carried to Samaria. 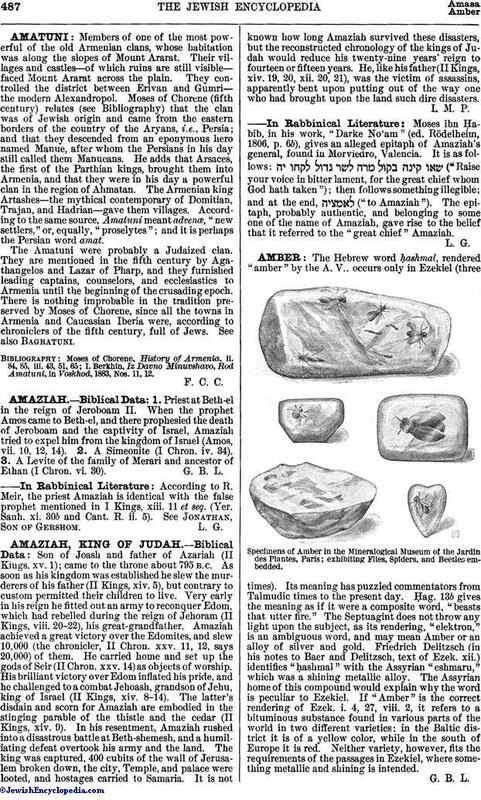 It is not known how long Amaziah survived these disasters, but the reconstructed chronology of the kings of Judah would reduce his twenty-nine years' reign to fourteen or fifteen years. He, like his father (II Kings, xiv. 19, 20, xii. 20, 21), was the victim of assassins, apparently bent upon putting out of the way one who had brought upon the land such dire disasters. Moses ibn Ḥabib, in his work, "Darke No'am" (ed. Rödelheim, 1806, p. 6b), gives an alleged epitaph of Amaziah's general, found in Morviedro, Valencia. It is as follows: ("Raise your voice in bitter lament, for the great chief whom God hath taken"); then follows something illegible; and at the end, ("to Amaziah"). The epitaph, probably authentic, and belonging to some one of the name of Amaziah, gave rise to the belief that it referred to the "great chief" Amaziah.